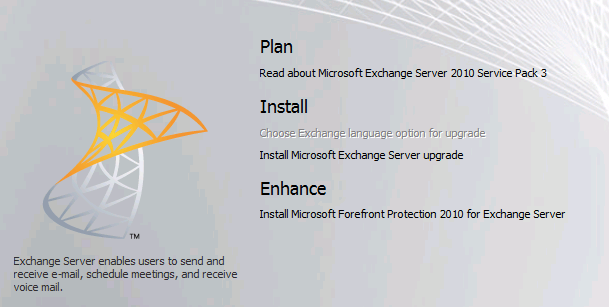 Most of us will want to install Service Pack 3 for Microsoft Exchange 2010, mainly because it allows the coexistence with Microsoft Exchange 2013. Unfortunately coexistence with Microsoft Exchange 2013 will be possible only after the release Cummulative Update 1 for Microsoft Exchange 2013 which is expected in the Q1 of 2013, but sooner or later it is worth to install SP3 for Microsoft Exchange 2010 to be prepared for the upcoming changes. As usual, we should first install SP3 in test environment, not in production right away, because you never know what to expect when you install Service Pack 3. 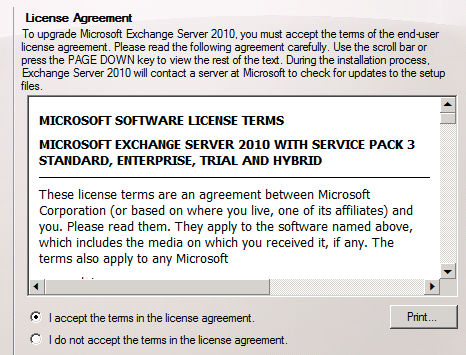 Below we show the installation of SP3 for Microsoft Exchange 2010, on the server with Microsoft Windows Server 2008 R2. Also if we have installed Exchange Management Tools we should also upgrade them. Also Active Directory Schema will be updated when you run upgrade for the first Exchange server. The CAS server roles that are in NLB, prior to installation should first stop the NLB server on which you want to install SP3. Run console Network Load Balancing Manager, select your NLB, then server which will be updated, right click on it and select Control Host and Drainstop. This will cause that no new connections to CAS server will be accepted. If you need to quickly disconnect all current connections to the server, then select Stop instead Drainstop. Once the server has no longer any active connections the server will have status Stopped in NLB console, only then we can proceed to install SP3 for Microsoft Exchange 2010. After installation the update, you need to reactivate CAS server in NLB console, selecting Start. Updating Mailbox Servers belonging to the DAG can be done without downtime and interruption to access mailboxes. The database schema has been updated in Exchange 2010 SP3. As a result, when Mailbox servers are upgraded to Exchange 2010 SP3, the databases are upgraded to the Exchange 2010 SP3 version of the database schema. The database schema upgrade process adds time to the overall service pack upgrade process. During the upgrade, the database is dismounted, and all mailboxes in that database are taken offline. If you’re upgrading the Mailbox server from the release to manufacturing (RTM) version of Exchange 2010 to Exchange 2010 SP3, the database upgrade process could take an additional 30 minutes or longer per database. This is because the upgrade process converts each database from Microsoft Exchange Server 2010 RTM to Microsoft Exchange Server 2010 SP1, from Exchange 2010 SP1 to Exchange 2010 SP2, and then from Exchange 2010 SP2 to Exchange 2010 SP3. If you’re upgrading from Exchange 2010 SP2 to Exchange 2010 SP3, the upgrade process takes less time. You can track the progress of the database upgrade process by examining event 1185 in the Application event log on the server you’re upgrading. Wizard will check all Prerequisites, when everything is correct select Upgrade. Installation of Service Pack 3 for Exchange Server 2010 can take a while (about 30 minutes), depends on Exchange environment. Tagged Exchange 2013 coexistence, Microsoft Exchange 2010 SP3, Microsoft Exchange 2013, Service Pack 3. Bookmark the permalink. Prior to the SP3 installation have you ever installed the SP1 on the RTM version of Windows 2008 R2? I am concerned that the SP1 will brick the Exchange Environment.